We've analyzed video playback in modern high-quality resource-intensive formats several times already. Unfortunately, it's usually difficult to apply test results to your own computer, because there's multitude of HD video formats and we might just miss the formats you are interested in. So we decided to conduct several additional tests in order to evaluate real hardware requirements for playing HD video on modern media, such as Blu-ray and HD DVD. These tests, in our opinion, may be interesting and useful to those building rigs with extra capacity for the future needs. First of all, let's briefly outline the formats to be used in this article. As is well known, the usual resolution of Blu-ray and HD DVD video is 1920x1080 (to be more exact, we have seen only such editions, except for bonus tracks in the standard resolution). Video may be interlaced or progressive; 24, 25 or 30 frames per second (the standard also includes other options). Video can be compressed with MPEG2, H.264/AVC, and VC-1 codecs. While the first of them is a very easy task for most modern computers, the others can pin down quite powerful PCs. In order to avoid it, GPU manufacturers have been using special units to offload a CPU when decoding "heavy" formats. We shall not analyze audio, which also requires decoding. We can only note that Blu-ray and HD DVD can use new audio formats, such as Dolby Digital Plus and DTS HD. But judging by how easily AC3 is decoded, the new formats will probably not be much harder to decode. The software player in our tests decoded audio to speakers via the analog interface, as the most resource-intensive option. Another option - transferring audio via the digital interface to an external receiver (which supports modern formats) - can theoretically reduce the load on a CPU. We compared digital output with the CPU-decoded option. The difference in the Dolby Digital format was about 1% (with Athlon X2 64 5000+). It's impossible to watch video without a special software player and/or decoders. Unfortunately, there are very few programs that can use graphics cards to decode video. We can even say that there are only two of them - Cyberlink PowerDVD and Intervideo WinDVD (the latest versions of Nero ShowTime can also do it, according to its developers). Besides, don't forget that new discs have a new protection system, which also limits the choice of players. So we've got these two players. Bottom line - you have to use a special software player to play optical discs of the new formats. If you want to watch you own video files created with AVCHD or a HDV camera (not protected), you can use the above-mentioned cameras as well as any other programs, because the former let the operating system use their decoders. Besides, you can use other decoders that support these formats, for example CoreAVC. The programs have another limitation - you can play HD discs only through the digital interface with a monitor/TV-set with HDCP support. It means that a graphics card and a display must support Digital Content Protection. If they don't (for example, in case of the DVI connection), the player will refuse to play video. However, there is one trick - protection is required from a digital connection. It means that you can watch protected HD video through an analog connection, such as VGA or component. Resolution will be really high only if a disc does not have a special flag that prohibits full resolution output through analog interfaces. Fortunately, no such discs have been manufactured so far. HDCP is sometimes associated with HDMI connectors. That's not correct. It's just HDMI (which is actually DVI plus S/PDIF) usually supports it, while DVI doesn't. We've been hearing about HDCP support in graphics cards for a long time already, but even now this feature is sometimes optional. So if you plan on using a graphics card for HD playback, you should make sure your model supports HDCP. What concerns displays, two-year-old TV-sets can already have a DVI connector with HDCP support. The situation with monitors is more complex, but many modern large models have this feature. We should also mention resolutions supported by HDCP receivers. There are only three scan options - 1280x720 (720p) and progressive and interlaced 1920x1080 (1080p and 1080i correspondingly). As most inexpensive panels have the physical resolution of 1366x768, you'd better use 720p mode with them. High-resolution computer monitors use the 1920x1200 mode. Unfortunately, a Full HD panel cannot guarantee the lack of black stripes on your display - some HD discs have the 2.40:1 format, which differs much from the 16:9 TV format (1.78:1), to say nothing about 16:10 monitors (1.6:1). Movie industry seems to live its own life and does not pay attention to technical resources of most users. This issue formally affects complexity of video decoding. We ran our tests on a computer with the Biostar TF7050-M2 motherboard on the NVIDIA 7050 chipset. AMD Athlon 64 X2 5000+ processor (2.6 GHz, 512 KBx2 L2 cache) can be easily downgraded to other models with OS tools to lock cores and RMClock to reduce clock rates. So we can determine minimal requirements for HD video playback. The diagrams will show clock rates and a number of cores. You can use our table to convert these data into model numbers (AM2 processors). We ran our tests with the core clock reduced down to 1 GHz. AMD do not have such models. But top processors can go into this mode, when you choose "performance on demand" in our OS settings or use RMClock. As we used a processor with 512 KBx2 L2 cache, all our clones inherited this parameter. Models with 1 MBx2 cache will be no slower than budget solutions. We used the ATI RADEON HD 2400 XT graphics card in our tests. This latest-gen graphics card from AMD/ATI has a special unit (UVD) dedicated to video decoding. A similar unit is available in a more expensive family - 2600. However, the top model (2900) does not have it (to be more exact, it has a prev-gen unit with fewer features). So in this case we use a graphics card intended for basic OS features, standard applications, and certainly multimedia. We should note here that it's not the cheapest representative of the series, it's the last but one in the model range. This product costs about 2000 rubles. According to the manufacturer, 2400/2600 cards do not differ in UVD performance. However, the 2600 cards can do postprocessing of higher quality owing to faster memory. When you browse the results, you should pay attention that "no-acceleration" modes are somewhat exaggerated - if your card supports it, why not use it. It's impossible to test all old cards. So you may try and apply these results to them, taking into account that reality may be better or worse. What concerns integrated graphics, it should be tested individually, because it loads a memory system, which is important in applications we use here. For example, when our motherboard uses integrated graphics, CPU load grows by 10% as opposed to using an external graphics card (no-acceleration mode in both cases). 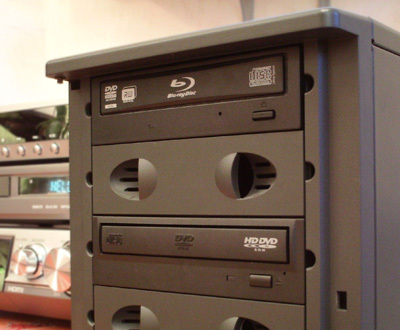 Optical drives were represented by Optiarc BDRW BD-M100A and Toshiba DVD/HD SD-H802A. Out of doubt, these drives are still too expensive to become popular - Blu-ray drives (unlike HD DVD, there exist BD recorders) cost about $600, while HD DVD (they can just read CD, DVD and HD DVD) can be bought for $260. You can also buy a notebook with a built-in HD drive. We used a 26" 1366x768 LCD TV-set with HDCP support connected to the computer via DVI. The player was tested in a normal window. But its load did not differ from the full-screen mode. It was proved by additional full-screen tests in 720p and 1080i modes, supported by our TV-set and on a 1920x1200 monitor connected through the analog interface. Tests were run in Microsoft Windows Vista Home Premium (32-bit version). We'll have to upgrade to this operating system sooner or later. And tests take too much time to rerun them later. In this test we'll use only Cyberlink PowerDVD 7.3 Ultra with Update 2911, which uses the following codecs: cl264dec.ax - 2.0.0.1709, CLVC1Dec.ax - 2.0.0.6711, CLVSD.ax - 8.0.0.1710, CLVSD_HBD.ax - 8.0.0.6711. Version 3104a available at the time of our tests did not allow to disable DXVA, and it worked incorrectly with some hardware configurations. It's sometimes important to choose the right version of a player or a driver. Especially as manufacturers are constantly releasing new versions. On the other hand, if a new beta version suddenly improves results, it suggests a sad they-finally-did-it-after-six-months or they-finetuned-it-for-another-test idea. Indeed there are a lot of versions and practically no proofs of improvements. So we decided to use the latest officially available version of drivers. This time it was Catalyst 7.8. We used the player settings to control hardware-assisted video decode acceleration. Player status during playback was used to inform about DXVA. Even though it's an official mode, the player is not open-source. Only its developers actually know what and how it does it (especially considering its strange behavior with Patch 3104a). On the other hand, this very player is used by real users, so its results are of practical importance. We didn't analyze video quality, but we had not gripes with it during our tests. We'll try to get back to this issue in future. Especially as there have already appeared special test applications. We monitored the load of PowerDVD on a CPU using system tools. System performance management was disabled, we used RMClock to control CPU clock rates. We played test scenes from our discs in this player, the results obtained for the reporting period were averaged. Video fragments were only five minutes long, approximately 1 GB of data. We also analyzed the CPU load graph in time and visually determined sufficiency of a given hardware configuration for comfortable video playback. The operating system usually automatically disables Aero interface during playback. But we switched to Vista Basic manually before running our tests. Besides, several additional tests showed that PowerDVD loaded the CPU, unlike the other processes that usually loaded the CPU by less than 2%. The acceptable load is 90%. In this case the CPU still has enough resources left for minimal system tasks as well as for variable bitrate (we'll describe this moment later). Insufficient performance looks like freezes in complex scenes. We also noticed problems with audio in case of single-core processors. Video clips would load the CPU much lower, because they don't require deciphering and usually have a lower bitrate. So if your computer can play discs, it will also cope with clips. On the other hand, clips can be played with another decoder, for example, CoreAVC. It can generate a lower CPU load compared to Cyberlink in no-acceleration mode. So our CPU recommendations may be not optimal - CoreAVC cannot use a graphics card to decode video. We'll start our tests with the HD video veteran - MPEG2. As we have mentioned many times, decoding this format is a very easy task for most modern configurations. So reducing a CPU load results in lower power consumption/noise/temperatures rather than in video playback on weak configurations. We should clear up another moment - interlaced video in some discs. Even though H.264 and VC1 can also be interlaced, we have seen only progressive discs with these codecs, and we've come across MPEG2 1080i. We used a BD disc with Pearl Harbor. It's a progressive disc with many complex military scenes for digital video. Unfortunately, it turned out a difficult task to find a fragment with a high bitrate. So along with an average load, we decided to measure maximum load - the higher the bitrate, the heavier the load in this class of tasks. We used the 1:28:00-1:33:00 fragment with a Japanese raid. The average bitrate of this fragment is 25 Mbps, maximum bitrate - 40 Mbps. By the way, this disc is in the 2.35:1 format, that is there are black stripes on top and bottom of the display. Analysis of the average CPU load shows that it cannot be used to evaluate performance of this fragment - average CPU load in noticeably slow modes was not very large - about 70-80%. However, as we mentioned before, this test fragment has a highly variable bitrate. So it will be correct to analyze maximum load on the diagram. We can see that HD MPEG2 is not a difficult task for any dual-core processor without using resources of a graphics card. It can lower requirements to a single 2 GHz core. If we don't use a graphics card for video decoding, a single-core processor copes with the load only at the highest clock rate. A performance gain from using UVD with MPEG2 reaches 1.5-fold. But these are theoretical results, because it's difficult to convert them into money - if you have a modern processor (or you are going to buy a new computer), everything works fine. If it's old, it depends on whether you have PCIe slots on your motherboard, whether it makes sense to upgrade only a graphics card, etc. Anyway, you should take into account test results of more resource-intensive codecs. Additional tests with unprotected data were run on the 2.0 GHz dual-core processor. CPU load with this fragment in these tests was lower by approximately 30%. That's a big difference. In particular, it's one of the explanations why results in this test are much higher than in tests with video clips instead of real discs. We had intended to test VC-1 on complex scenes in the new "Flags of Our Fathers" movie. However, "Full Metal Jacket" has higher requirements, perhaps it uses a higher bitrate. It was necessary, because the movie was twenty years old and noisy. We used the 1:31:00-1:36:00 fragment for the test. The bitrate was practically constantly at about 27 Mbps. This movie has the 16:9 image format. We should mention noticeable oscillations of CPU load, which have nothing to do with scene complexity. However, they had no visible effect on playback. Perhaps, it's a peculiarity of our testbed, because other HD DVD discs encoded with VC-1 demonstrated a similar picture. This fragment was used to evaluate average and maximum CPU load. But the difference between them was less noticeable (3-6% in non-marginal modes) than in the previous case - that's the effect of a more uniform bitrate. We'll analyze only maximum load data. The graphs show well that VC-1 requires more CPU resources to decode than MPEG2. Dual-core processors barely cope with this task without resorting to a graphics card (2.6 GHz is not the highest clock rate for dual-core processors from AMD, so top models have a chance to succeed here). Single-core processors are out of the question. But UVD changes the situation cardinally - a single-core processor running at 1.8 GHz can decode VC-1! A graphics card reduces CPU load by three times. We cannot say that a graphics card offloads a CPU completely, but it's still a very impressive result. We can draw another nice conclusion: "The right graphics card is better than the second core!" In case of this task, you can actually save money, if you choose the right configuration - instead of a dual-core processor operating at 2.8 GHz you can buy a 2 GHz model (the difference in their prices is about $100 now), the RADEON HD 2400 card, and there will still be some money left. You must understand though that it's a highly tailored solution. This replacement will be interesting only for this very task. Most other tasks (for example, video editing) prefer a faster processor to an entry-level graphics card. Dual-core processors cope with decoding unprotected content - the CPU load is three times as low with this fragment compared to the original disc. Using a graphics card to help decode video yields a better effect here - the load on a dual-core 2 GHz processor is six (!) times as low with UVD as without it. AVC/H.264 was tested with a "Casino Royal" Blu-ray disc. We evaluated CPU load by a 5-minute fragment in the beginning of the movie (0:10:00-0:15:00). This dynamic chase scene is complex enough for the codec. According to the player, maximum bitrate reached 29 Mbps, average bitrate - 28 Mbps. Weak configurations showed insufficient performance here - they played high-bitrate scenes with a "strobing" effect. This movie is again wider than 16:9, so there are black stripes on top and bottom of the screen. The load in this case is a tad lower than with VC-1, but the layout of forces is preserved. Only top models of dual-core processors operating at 2.6 GHz and higher can cope with decoding this format without resorting to a graphics card. Single-core processors will require help. In this case a 1.4 GHz model may cope with the task. 1 GHz dual-core processors can provide a sufficient performance level. Conclusions here are identical to those for VC-1 - a graphics card with a special unit to help decode video allows to use mediocre (not very expensive and hot) processors in your media center. Unprotected content can be played back by a computer with a 2.0 GHz dual-core processor without active DXVA (the lack of digital protection halves the CPU load). Active UVD offloads a CPU by five times. We used Rivatuner to monitor GPU temperatures in these tasks. Unlike 3D applications, HD video playback does not heat a GPU much - GPU temperature inside our testbed grew from 45° to 50° maximum. This table sums up our test results in the form of configurations that offer sufficient performance to play HD video. Our analysis proves that we can actually build a quiet and cool media center to play modern HD video on Blu-ray and HD DVD. The secret is in using graphics cards of the latest generation. They possess a special video decode unit, which cardinally offloads a CPU during video playback.